I've been painting with watercolor for over ten years. I like to use a lot of paint, and I especially like to paint dark backgrounds. My painting style has evolved over time, including how I paint my backgrounds. I started out just painting my subject first and leaving the background for last. It is always exciting to paint the cool stuff first, right? Well, when I saved the background for last, I always ended up asking the question: "Now what do I do?" I've learned over the years to plan and incorporate my subject into the background first before I do anything else. The following tutorial is my way of painting backgrounds, and I am sure that it will evolve more as I continue to paint. 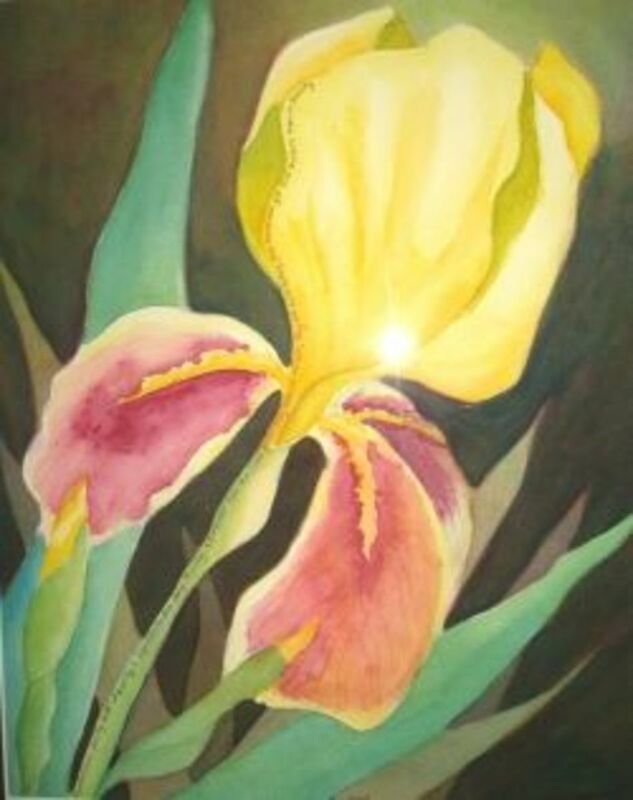 The watercolor painting above is one of my first using a dark background. 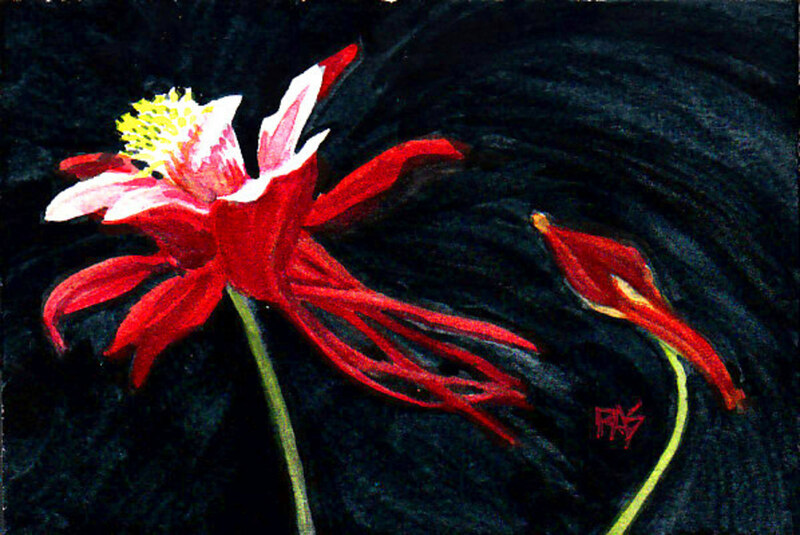 I painted my subject first and then painted around the Columbine flower using a thick coat of Indigo Blue. It was successful at the time I painted it as it gave me a nice dark background, but I was limited in my ability to vary the background color and to add depth to the painting. This painting above is one that I did last year with the new way that I paint dark backgrounds. It takes a little more planning and time, but it is very easy to do. The following tutorial shows pictures of how I paint using thin layers of paint (or glazes) of the three primary colors of red, yellow, and blue. Using thin layers and mixing my own colors on the paper gives me a more luminous background as you can see all the different layers of color together. The following tutorial will show you step-by-step how I do this. When layering many layers of watercolor paint, start with a paper that will stand up to the layering and repeated wetting of the paper. There is nothing more frustrating than to get halfway through a painting and the paper starts to breakdown. 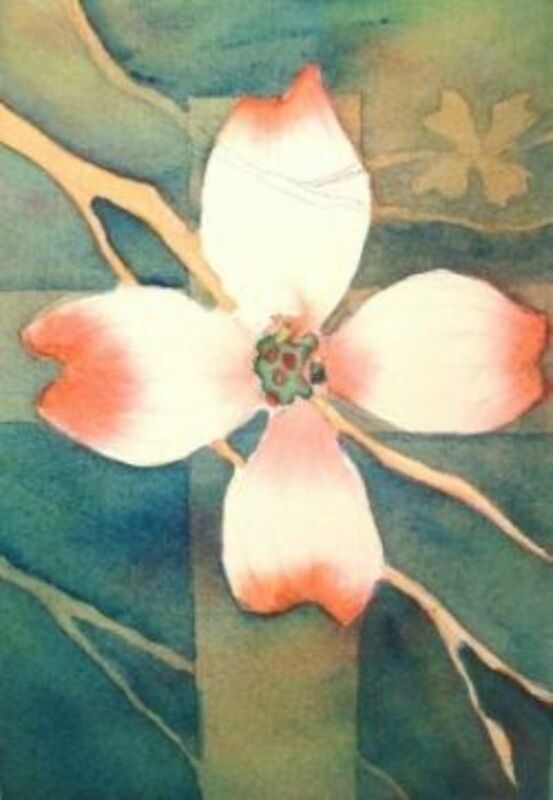 My choice of paper for watercolor is Arches 140# cold press paper. Always use 140# or thicker paper. 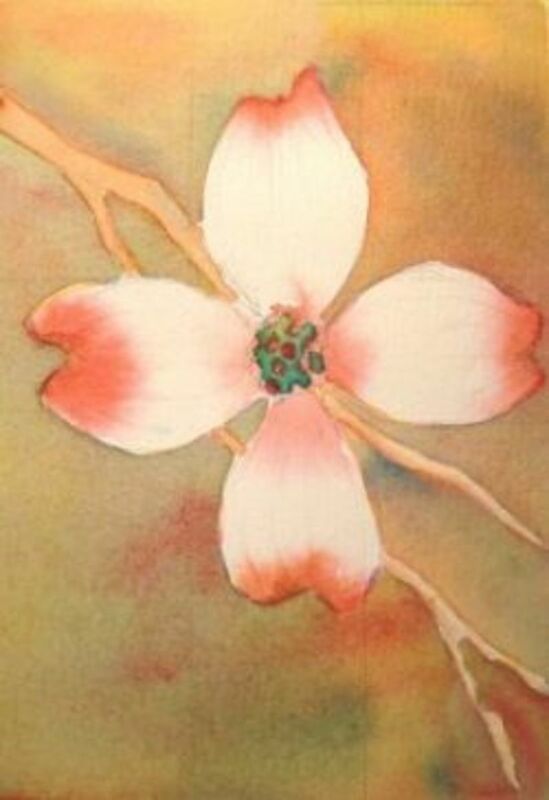 The following series of the dogwood painting shows how I paint and plan my background. I sketch in my subject, paint my subject, then start painting around my subject (negative painting). On this painting, I started with antwerp blue for the background. Next, I added a glaze of aureolin yellow. Each time I let the watercolor layers dry thoroughly before adding the next layer. It is important that when painting on top of other layers, that a light touch is used so that the previous layers are not disturbed. I then paint a layer of quinacridone rose. Pick out primary colors that will mix well together. Some colors do not mix well and give muddy results. I will be adding a tutorial in the future on how to mix colors and pick colors for your pallet. At this point, I go back to the antwerp blue, but this time I sketch more into the background. 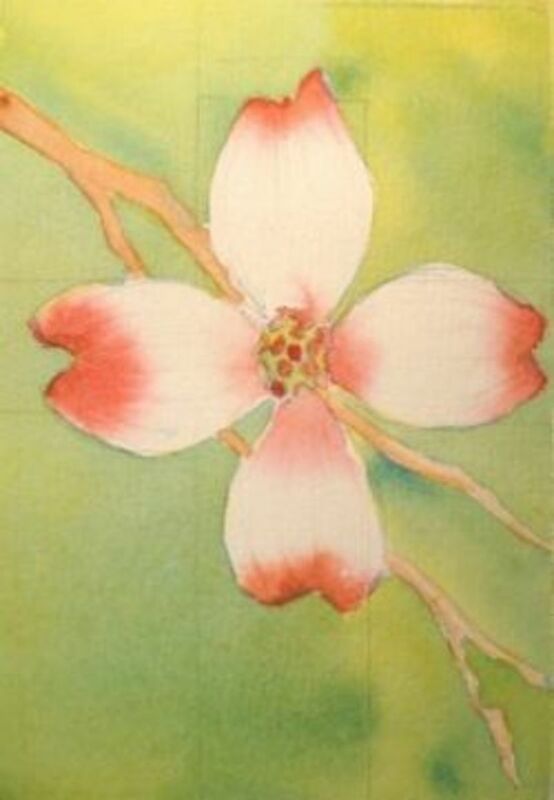 Waiting for this point to add more elements in the background makes the background branches recede, because they are now a darker, more muted color than the foreground dogwood flower. After the antwerp blue layer, I repeat the aureolin yellow, painting around the background branches as well as the foreground. Using this method slowly builds the darkness and depth of the background. At this point, I can see that I'm getting close to the desired darkness that I want. Now I try to control my color by adding more blue and yellow and leaving out the red so that I can have a predominantly dark green background. In this last step, I added some dark tree limbs in the background to add even more depth to the painting, and then I painted in some shadows around the flower and branches. 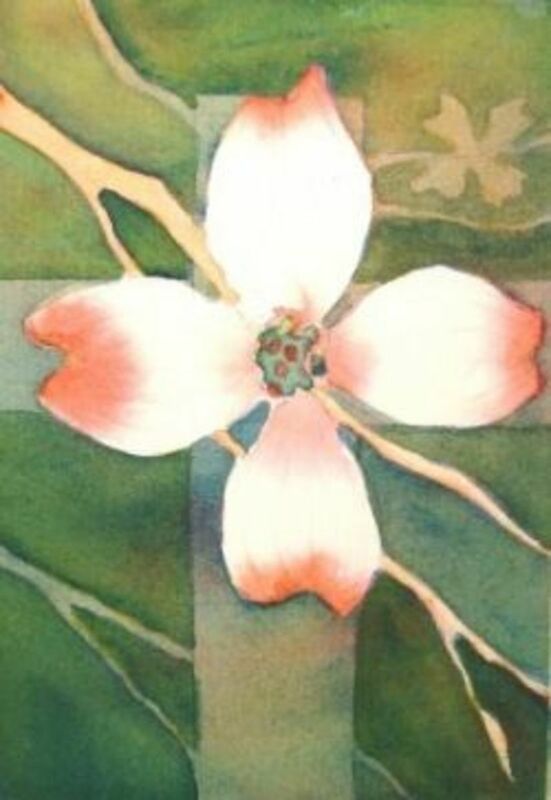 There is great symbolism in the dogwood flower. 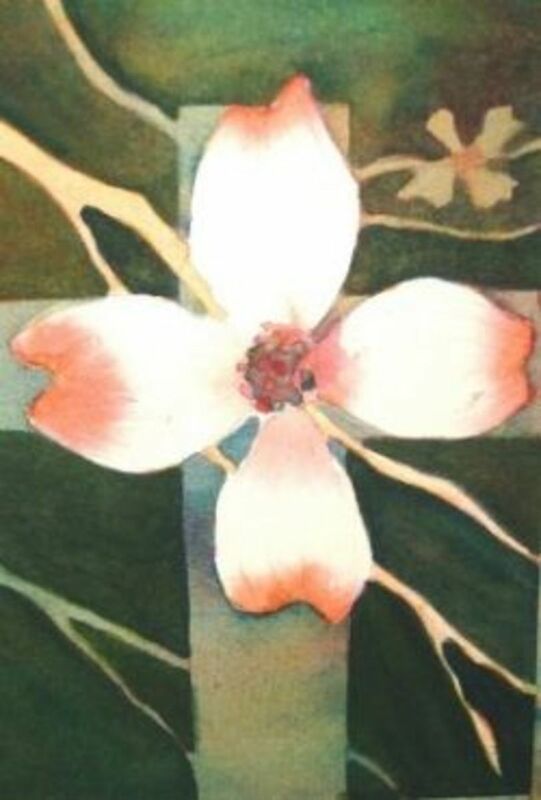 I got the idea for this painting from the legend of the dogwood that states the petals of the dogwood flower represent the cross of Christ and that the petal indentations represents where the nails were placed on Christ's hands and feet. Painting backgrounds layer by layer takes much more time than adding a few layers of one color, but I think the results are much more luminous. The three primary colors that I've used in the above tutorial are: Antwerp blue, aureolin yellow, and quinacridone rose. Other hues of primary colors can be used, but some combinations may give muddy results. Experiment first before using colors of choice on the final work. I use Daniel Smith paints for most of my work. 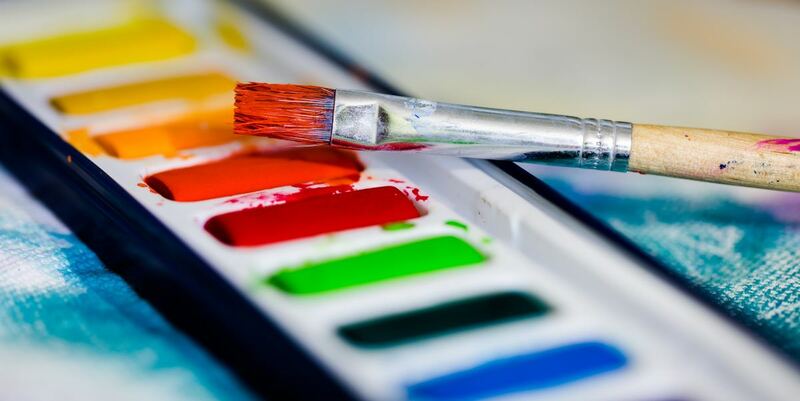 Any artist grade paints will give you the best results. What background colors did you use in the second painting in this post? Questions or Comments About My Watercolor Technique? If I remember correctly, I used aureolin yellow, quinacridone rose and indigo blue. What colors did you use in your second painting? No, I don't wet before adding the background paint. Just get enough paint and water at a consistency on heavy cream. Keep a bead or line of paint at the bottom while painting. It helps to paint with your board and paper at a slight incline. This helps in keeping your paint from drying as you paint around your subject. Do you wet the original paper before beginning background? Thank you! I was looking for tips to make my focus "come out" of the background. Not really in a 3-D way but just in a way that it seems to be coming out. If you get what I mean. I like this post and tutorial. I think I'll have to add to my background now. @christopher-nicholson-3154: Thanks for your comment Christopher, and I'm glad that you benefitted from the lesson. 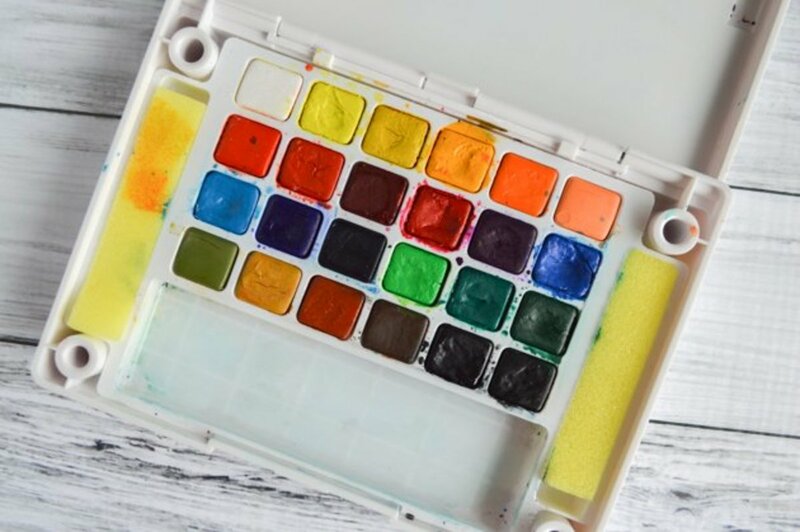 I'm sure that this technique would work with the acrylic when used transparently as watercolor. I would love to hear your comments on how it works for you with the acrylic. And yes, when I submit to the cross of Christ, my life takes on a whole new meaning of blessing. Hi Carol, I didn't know you could do so many layers with a wash. I paint full time, my subject of choice is birds of prey - in acrylic but used like watercolors. Enjoyed your subject and dogwood flower - cross, it is amazing that as we bring our frailties to the cross and embrace the plan God has for us that things really work out. Great lesson, will get started in the hope of doing backgrounds of this standard. Your watercolor lenses are making me want to try watercolors. I always thought they were too tricky to use but you are making it very easy to understand. Another great lens! Thanks. Both ways are beautiful to me. I haven't really worked with watercolors much, but this makes me want to try. It really is different than oils. Well deserved purple star. I see from this, you added the dark background after the main foreground flower.. It's confusing me, cuz with oil I do the background first. 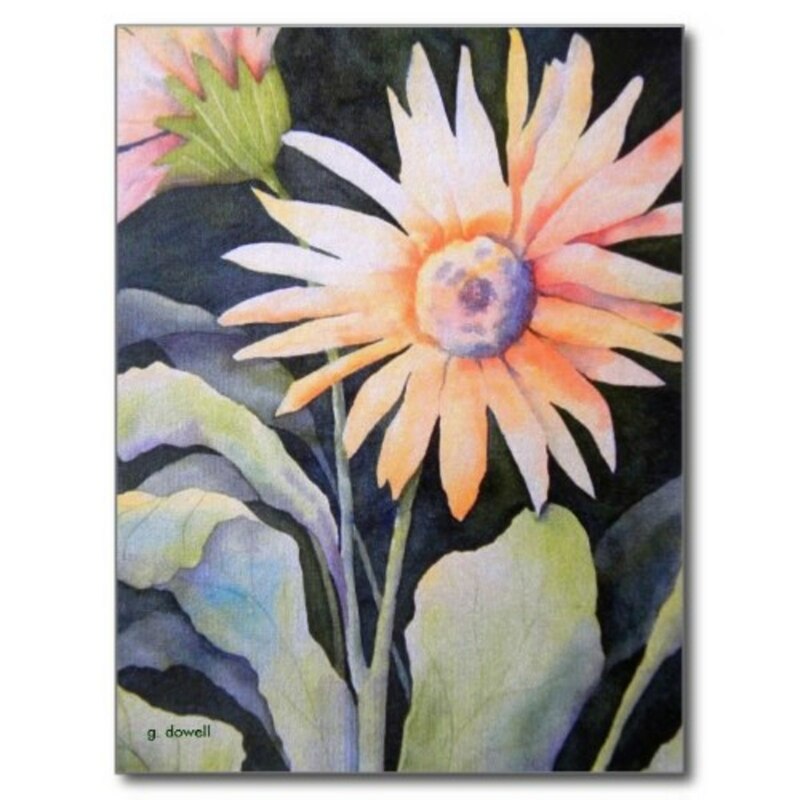 Doesn't the water color bleed into your flower space? Still, I love your paintings. A very nice step by step lens. I totally endorse the fact dark backgrounds really make flowers "pop". I also heartily recommend the Arches blocks - my favourite watercolour painting surface - love the fact there's no need to stretch! I have usually had problems with doing backgrounds. They either look muddy or just plain ugly and ruins the picture. I am trying your method. Thank you. 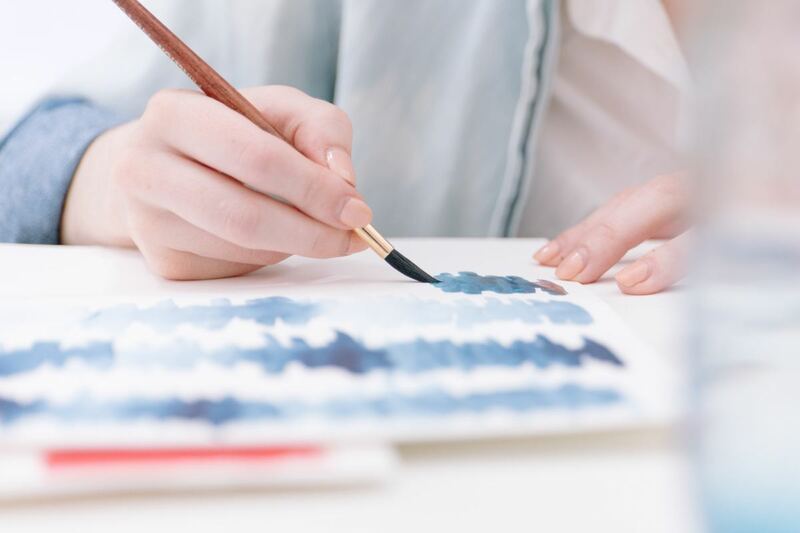 Thank you for sharing this lens "How to Paint Dark Watercolor Backgrounds"
These are so beautiful! I love watercolors. So pretty! Great tutorial. Thanks. I paint watercolor portraits and am just learning to use the glazing method. Fabulous lens. You have some wonderful tips. 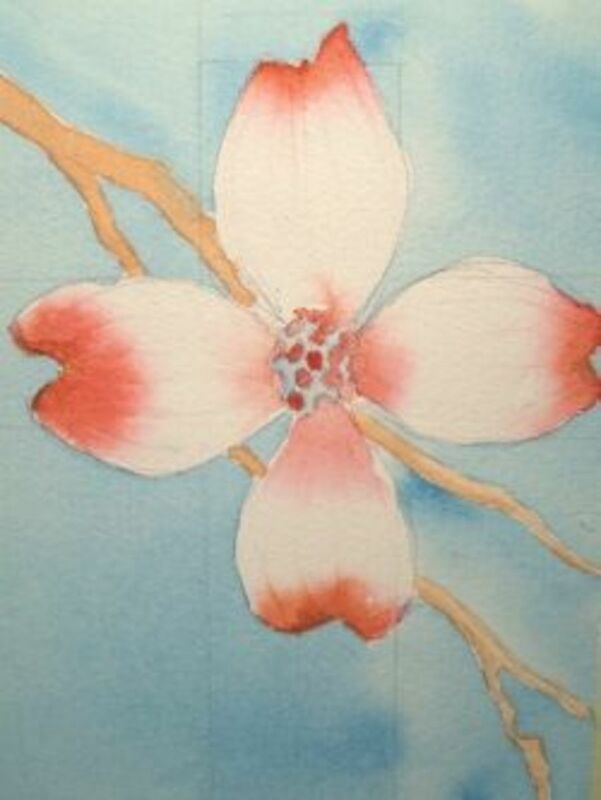 I love watercolor. Thanks for sharing. Really great lens- stay creative! Wow that is amazing seeing it all come together step by step such beautiful artwork! Came back to bless this wonderful lens. You are so talented! The walls of your home must look amazing! Thanks for sharing. My one sister is the artist in our family. I have always longed to be a painter -- perhaps one day. I would love to start here! 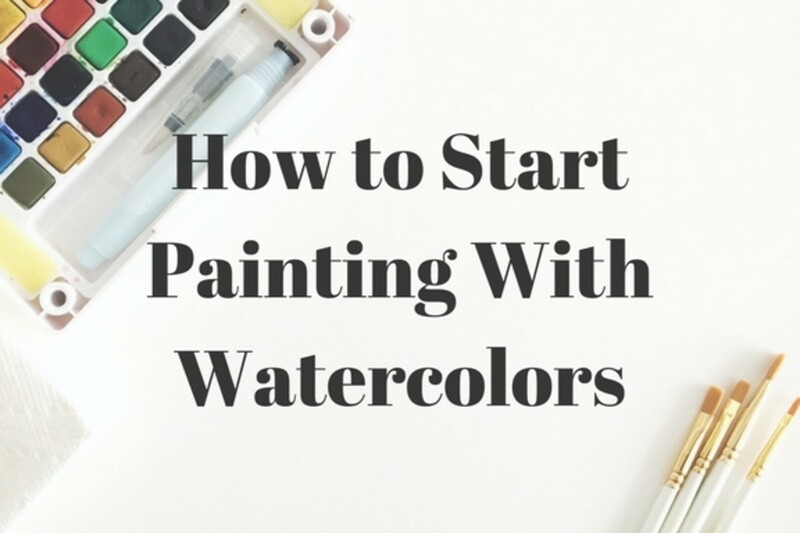 Great tips for watercolor artists! YAY!! WOW I love the water color paintings shown. I love painting with water colors. Lovely helpful art lens.Thanks for visting liking commenting on my lens Puppets and making them I am angel blessed. Returned to take another look at this great tutorial lens, it has helped me to create some interesting art, thanks. This time I am able to leave a little angel dust - blessed. My daughter loves to paint with watercolors. I will be forwarding her this information. Beautiful! My Dad loves watercolor painting, my daughter is exploring the medium. I have no painting talent at all. Thanks for visiting my "Motion Mindset" lens! Reminds me a bit of a TV episode which I saw recently of Rolf Harris painting Queen Elizabeth. He splashes large areas of background, then slowly adds layers to narrow the detail. His material has always fascinated me. Wow these are beautiful, you have talent. Thanks for stopping by my lens. I wish I could paint like that. Great lens! Very nice painting. I wish I will be able to draw like you too. Thanks! 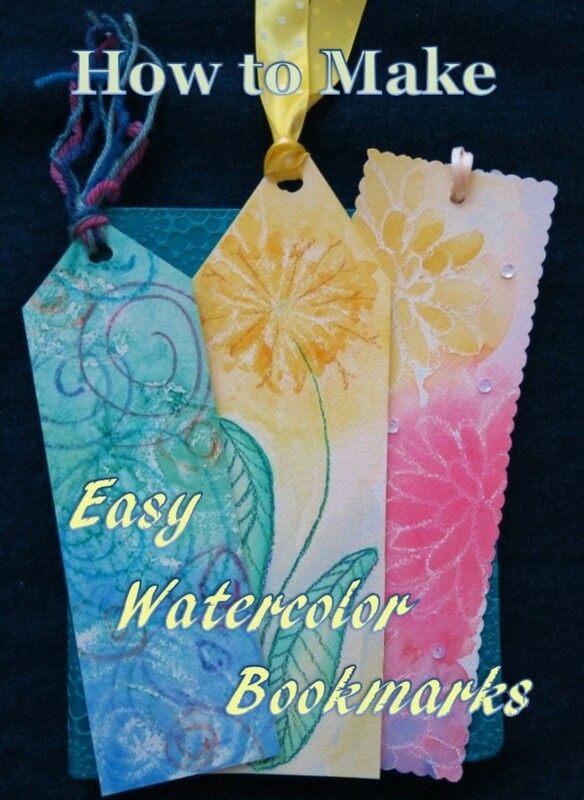 Thank you for this great tutorial on painting a dark watercolor background. I have been working on a painting with a dark background and playing around with some ideas so this will be very helpful. Beautiful lens. I love to paint, but I'm not very good at it. Adorable paintings. Designed in dark background is an amazing thing, especially color combination inspires me. Again, love your paintings. Will have to try this way of glazing in the background. I like what happens. Thanks so much for this lens. Wow! 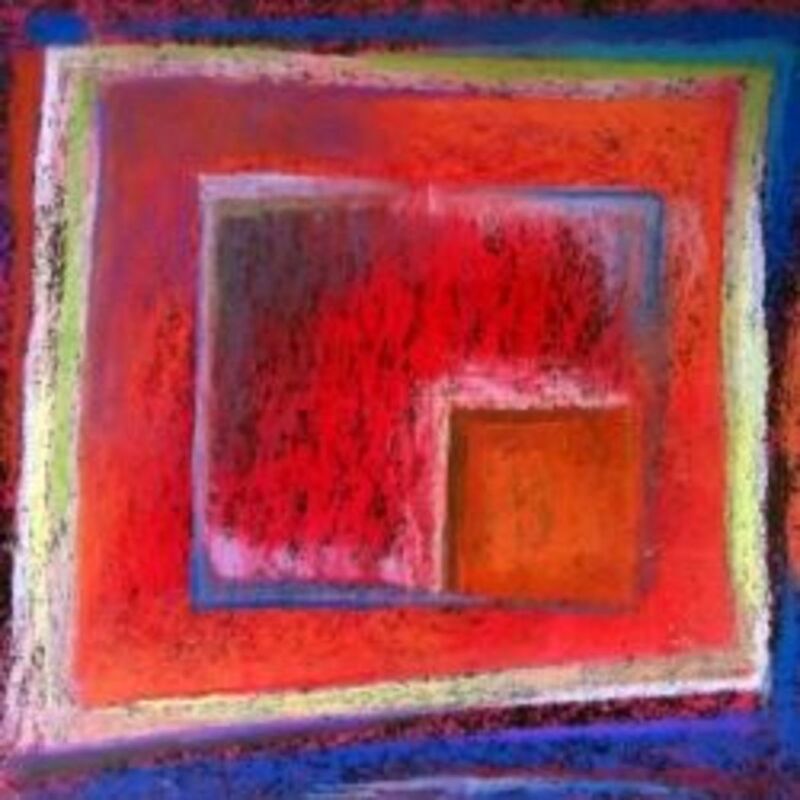 I adore your paintings, especially the color palette you choose for most of them (like the blue-purples)! Beautiful lens! @cdevries: You are welcome. I'm glad that you can adapt the info. to meet your need for your theater sets. This is why I love sharing information on Squidoo! I think your advice may turn out to be very useful to me... I design theater sets and usually need a dark background for renderings, but one that's not too harsh. This may let me "fade out" into darkness in a nice way. Thanks! Stopping back to take another look at your beautiful watercolors. I love your style of painting. Water coloring is so different from oils. This is a wonderful tutorial on layering to get the desired affect. "blessed"
beautiful photos! like ur lens! Very good tutorial and advice! Brilliant! What a great tutorial, Simple and clear. You have inspired me - my backgrounds are usually rubbish! Watercolor technique is not my favorite, because it produce too vague and foggy results too often. I your lens you proved this is not always true. Despite dark colors the pictures are light and full of life. Thumbs up! Thats a beautiful tutorial with amazing results! Love the tutorial..I have been a DIY enthusiast for long time..and though I am no expert, I do paint frequently..Adding textures and colors to the background was something that I never was able to do like a pro, but your tips make it seem viable..Thanks!! Thank you for your well explained tutorial. I have learnt a lot! 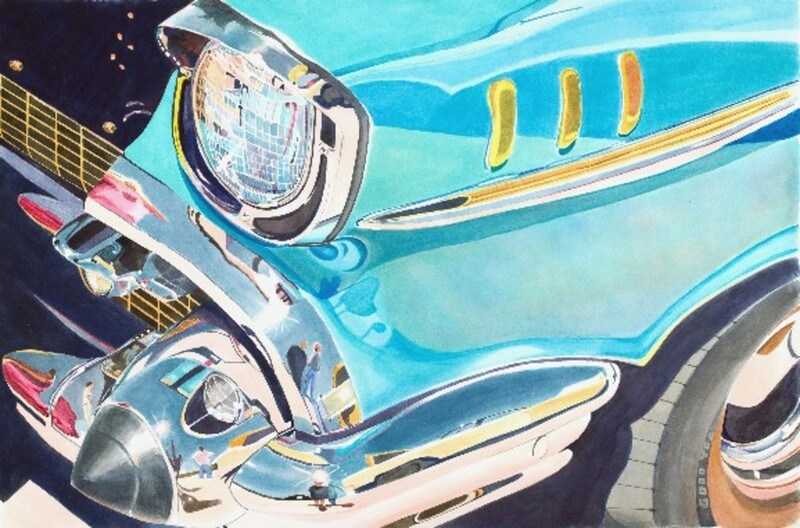 Excellent tutorial on watercolor painting and building layers of luminescent color! What a beautifull lens! Thank you for posting thumbs up! Excellent lens and beautiful artwork! Thanks for sharing your background technique. Dark ones are definitely trickier, and this is helpful. What you did with the background really works. There is more depth. Nice tips. I lkie the use of your old technique as well. This is awesome. My new year resolution to learn watercolor painting. This will go on to my guide list. I wish I could be an artist like that! I've always said that the next-best thing to nature photography (my passion) is painting. It amazes me at the skill and great detail that goes into your work - and how you make it sound easy when I know it is not! Loved this lens so much. Thank you! Just beautiful! Of course, even your old way far outshines anything I can do, but your new way is just gorgeous! Lovely work and thanks for sharing! I love your Watercolors and your technique! I've been an amateur artist most of my life. I'm drawn to everything creative (except food and the kitchen). Watercolor being my biggest challenge of all, you have really cleared up some problems, gave me some confidence to try again! Thanks for your tremendous lens! You have been blessed by a Squid Angel! If you have never seen works by "Paul Jackson", there are a couple of sites out there with his work. Just Google his name. I had the honor of featuring one of his watercolor's on one of my lenses, with permission of course. I love yours as well and bookmarked your page! 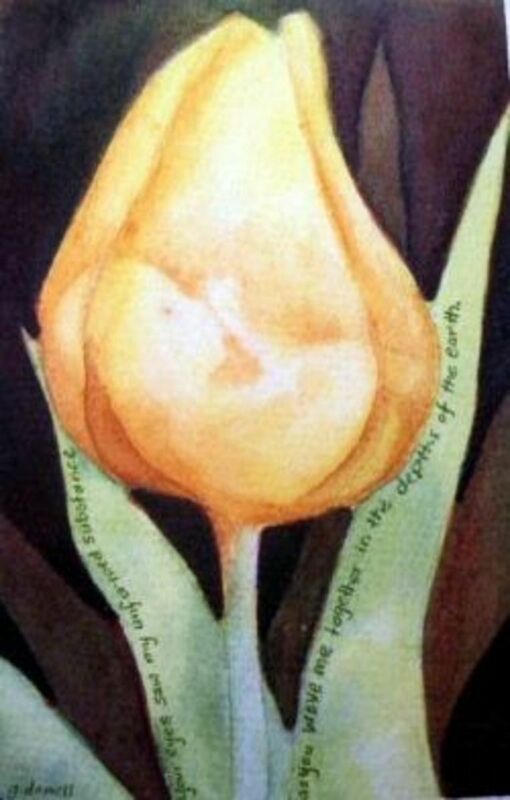 I really like the dark background of this watercolor. I have been considering taking up either watercolor or acrylic painting again after many years of not touching a brush. Your lense just gives me a little more of a nudge to dive in and paint again. I will watch for more technique tips from you soon. I wish I could paint. Thanks for sharing, though. Nice lens and very useful information. Beautiful work and very nice lens! Very inspiring lens! You're very talented, keep up the good work! You are very talented. 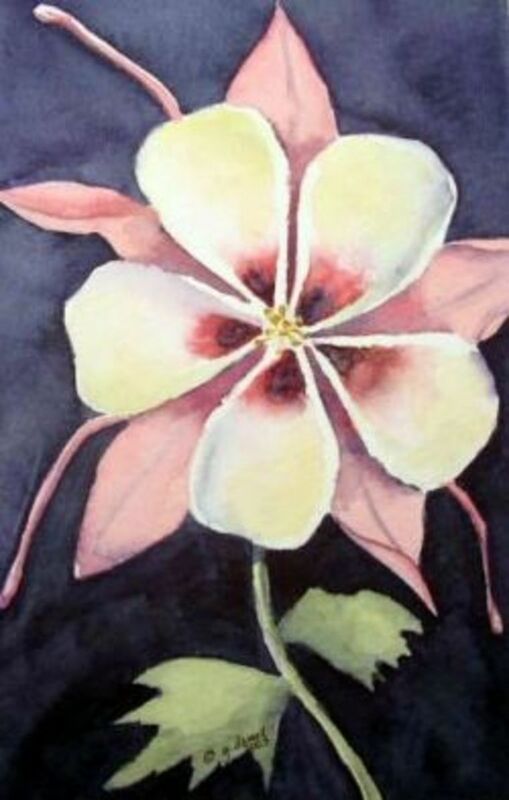 I love the Columbine. I always wished I had some talent in the area of art, but not that lucky. I have to enjoy the work of others. Nicely done. What an amazingly beautiful lens and technique. I need to get my paints out quick! Blessings. I've just taken up painting (one stroke). Images look really nice. Very good info. Always ready to hear what others are doing in the artwork. Like your new way of doing the backgrounds. Thanks for sharing. I've always enjoyed sketching and painting (atlhough I'm not good at it and haven't had any training in it). My daughter is an aspiring artist and is very good at it. I'll pass along this information to her. Good stuff! Congratulations on a Squidoo masterpiece!